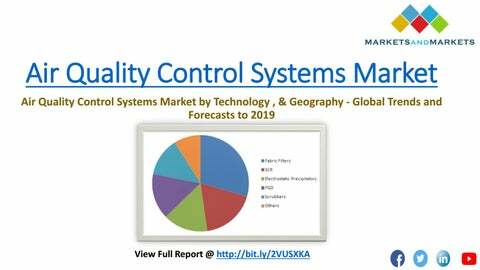 Introduction â&#x20AC;˘ Air Quality Control systems market will grow from an estimated $58.7 billion in 2014 to $78.0 billion by 2019 with a CAGR of 5.8% from 2014 to 2019. â&#x20AC;˘ Browse 55 market data tables and 22 figures spread through 186 pages and in-depth TOC on "Air Quality Control Systems Market By Technology (Flue Gas Desulfurization (FGD), Electrostatic Precipitators, Nitrogen Oxide (NOx) Control Systems, Scrubber & Mercury Control Systems) & Geography - Global Trends and Forecasts to 2019 "
Drivers â&#x20AC;˘ The air quality control systems market is at various stages of development and opportunities are diverse across the regions. In emerging economies such as China and India, the market is tied to rapid industrialization and urbanization activities. â&#x20AC;˘ Government and regulatory bodies in these regions are implementing stringent regulations to effectively reduce the emission from these industries. â&#x20AC;˘ However, the matured markets of Europe and Americas are approaching to get the best systems involved and reduce their emissions. Industrial Insights 笶傍he global air quality control systems market is segmented on the basis of the types of technologies which include flue gas desulfurization (FGD), electrostatic precipitators, fabric Filters, Nitrogen Oxides (NOX) control systems, scrubbers and mercury control systems. 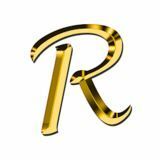 笶傍he market is further segmented on the basis of regions such as Asia-Pacific, Europe, Americas, Middle East and Africa. End user applications for each technology are also analyzed in the report. 笶傍he coal fired power generation industry market accounted for the largest share of the total air quality control systems market in 2013. Coal is the largest source of energy for generation of electricity worldwide. 笶傍he large scale use of coal pollutes our environment with toxins creating global warming. AQCS are capable of drastically reducing air pollution emissions from coal-fired power plants, in turn driving the demand for these systems at exponential rate. Regional Insights o The global air quality control systems market is expected to reach $78.0 billion by 2019, growing at a CAGR of 5.8% from 2014 to 2019. o In terms of market size, Asia-Pacific stood first followed by Americas and Europe in 2013. o Increasing demand for energy and rapid industrialization has led to increase in the emission of exhaust gases and toxic pollutants, creating a huge demand for these systems in the region. o Between 2014 and 2019, the region is expected to witness the highest growth at a CAGR of 6.7%, to reach $45 billion by 2019, up from $28.6 billion in 2013. Key Players ▪ Some of these include companies such as Alstom (France), Babcock & Wilcox Company (U.S.), Foster Wheeler (U.S.), Mitsubishi Hitachi Power systems America (Japan), Hamon RC (U.S.), KBR (U.S), and Siemens Energy (Germany). ▪ The leading companies of the air quality control systems market focus on the growth of their contracts & agreements with the key objective of serving various industry sectors with wide geographic presence. ▪ The top companies have been able to acquire majority of the contracts with end user industries.